Imagine this situation. You are offering carrots to tigers and meat to rabbits in a zoo or a forest. Well, the food you provide is nothing but utter waste. You cannot engage a lead just like that. It shows that you are stuck with different b2b demand generation myths. Have you seen the movie “The Wolf of Wall Street”? Well! How does it relate to a b2b demand generation myth? Demand generation means creating a liking for your product among the customers. Leonardo DiCaprio played the role of a smart stockbroker named Jordan Belfort. Jordan while addressing the salesmen in a seminar asks them to sell him a pen. Each one of them will try to mention the specialties, benefits, and features of the pen in an attempt to sell it. However, he would not be satisfied. “Sell me this pen” is the famous phrase that goes rounds in the business and marketing industries. Now, I ask you the same question. Do you start selling a pen randomly to a person? No. When you are about to sell, you ask questions to the customer, find their preferences, then decide to sell the product. It is just a simple principle of demand and supply. Without knowing what your customers want, how can you sell something? You learn a lesson from both cases. Just because you have a b2b lead, you start engaging with it. You do not find out if the leads match your niche target audience. Then, you go on with highlighting their benefits, specialties, and features. Both these cases highlight that marketers find themselves struck in different demand generation myths. Marketers sell the wrong products to the customers without knowing what they need. These cases highlight that in the b2b demand generation, the guiding force of myths lands you only with the waste of resources. 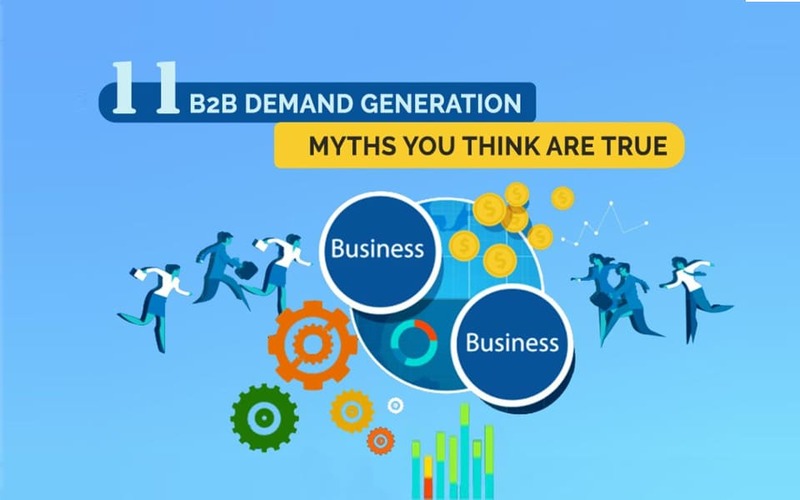 Let’s expose some b2b demand generation myths that you think are true. It would great if you spend some valuable time to get yourself out of some false myths. Truth: The buying journey of customers has turned highly complex. The advanced tech world exposes the customer to numerous content types in multiple channels. Year-on-Year content is becoming increasingly complex. Buyers’ approach is also taking a new turn. Hence, there is no shortcut for b2b demand generation. You must implement and strategize every step for demand generation. Truth: Data quality affects conversion rates profoundly. You won’t get deals if you merely fill the top of the funnel with leads. You must work with the leads and segment them based on preferences. Once you filter the interested customers, you work on them and turn them as your prospects. Finally, you work with those marketing qualified leads and close the deals. Randomly selling to the leads at the top of the funnel is like asking someone on the first date to get married. Never do that with your leads. Get to know the leads. Then, engage with them. Strive consistently to keep your sales funnel full and in motion. Truth: The best demand generation programs keep pushing down the relevant and consistent campaigns down the funnel. You must attract new leads, engage and nurture with them consistently to generate leads. B2b demand generation is a continuous and ongoing process. Continuity of the b2b demand generation programs at a consistent pace builds momentum to your b2b marketing campaign. Attract new leads, engage and then nurture them. Truth: All that glitters is not gold is a famous proverb. Similarly, all that is a lead will not convert is the fundamental truth in b2b demand generation. Qualified leads are the need of the hour for b2b demand generation campaigns. You must first know your niche target audience, build an ideal buyer persona, customizing your messaging to the targeting audience channel mix and so on. You must undertake focused marketing that aligns with the buyers’ journey. It would be best if you customized your b2b demand generation programs to your buyers’ journey. Your customer interactions (messaging, content, media, and channel) must align with your potential customer goals. Truth: Your sales team is essential for the successful implementation and management of the b2b demand generation campaigns. Sales team ensure that you get the right results down the lane when working with lifecycle mapping and buyer personas. Define your protocol for a sales-ready lead. It helps you to segment leads and ensure better pipeline management. Truth: Not everyone can get the most valuable leads. However, the most useful leads can come from anywhere. Cold calling and email massive email campaigns can provide you the best leads. To keep a consistent flow of leads, you don’t necessarily need a stellar website. You must continuously experiment the response of your target audience in different channels. You must focus on getting the right understanding of valuable leads, customizing the right content to them at the right time. Truth: The usual buyer journey or sales funnel is static. However, your content must never be static. The lengthier your text-based content remains, the more the customers scan it. Your static approach in demand generation will not work the way it needs to. In a static approach, you document the responses of the sales and marketing teams and then implementing them. Implementation of the documented findings through reviews and research takes at least six to nine months. By then, the data you collect turns stale. It turns faulty. Build, develop and implement a dynamic approach where you match the changes in buyers’ requirements and preferences. Modernize your b2b demand generation campaigns around a dynamic approach. Truth: Technology must facilitate strategy. It must not be the other way around. Technology increases efficiency and makes us advanced in our work. Define your demand generation strategy. The, decide upon using the appropriate technology. Truth: Content is not the king. The customer is the king. Content is the way of serving customers. If more and more content can increase demand generation, then all websites do have it. But not all sites with bulk content achieves in b2b demand generation. Rather than more content, marketers require better content. Your content must engage with a meaningful dialogue with the customers and align with their journey. Develop your content based on your buyers’ movement in the buyers’ journey. In other words, prepare customized content based on the buyer’s journey to trigger your b2b demand generation results. Truth: Demand generation marketers would require three essential things. They are data analytics, massive number crunching, and marketing technology. Truth: You cannot control your buyers’ decisions. There is no set logic for the customers to respond to your moves accordingly. Either they can decide to buy your product at the first stage, or they can exit from buying in the final phase of your b2b demand generation campaign. You can set up your CRM and content and meet with the customers based on their behavioral responses in the sales funnel. You definitely cannot control your b2b buyers, irrespective of skills you had mastered. Hey! It looks like you have got listed all your demand generation myths. Its hi-time that you work upon getting yourself released from the false myths. All you need to make sure is to consistently, continuously and effectively keep working on your qualified leads. Share in the comments section about the myths you had during your b2b demand generation campaigns. If you wish to obtain b2b data, then you can get it from www.datacaptive.com. For any queries on b2b demand generation myths, contact us through [email protected].